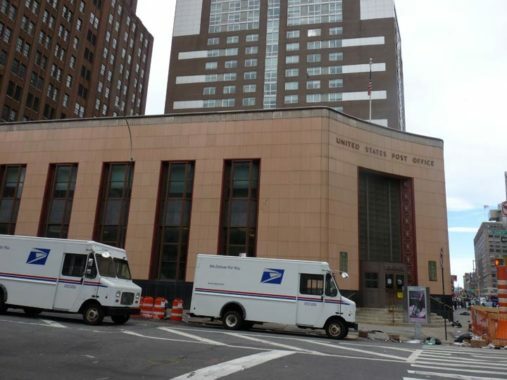 With no express roadway, truck traffic employs Canal Street to get from, say, Brooklyn to New Jersey, and NYC drivers, especially truck drivers, are horn happy when they are feeling thwarted or delayed and the sharp, sudden horn noise can be maddening. Canal Street’s small retail businesses, which often involved sidewalk displays, have always attracted large crowds. 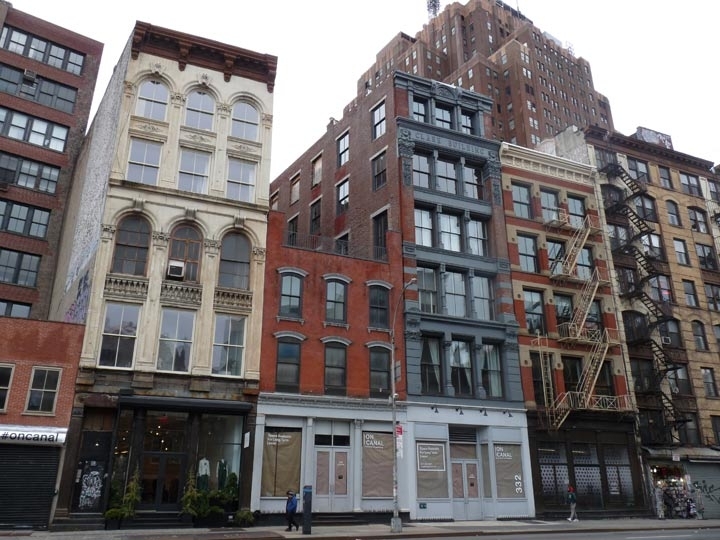 Unfortunately in recent years, such small businesses have been priced out by rising rents, as Nathan Kensinger relates in a 2018 Canal Street feature in Curbed. Nevertheless I girded my loins and sallied forth on a relative early Saturday morning around 10 and found things relatively bearable along Canal, and I also got in some scenes in SoHo and the Lower East Side I will jot down in future FNY pages — but this particular feature will deal with Canal exclusively. This plaque, designed by Jay Van Everen and located the BMT Canal Street station serving R and N trains opened 1/5/1918 is a reproduction of an 1800 print that shows Broadway extending over the canal where Canal Street would be built. 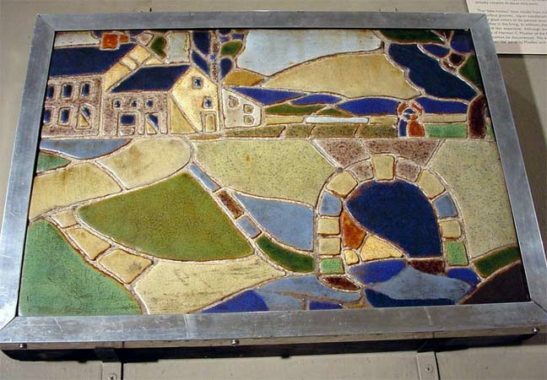 When, in the mid-1910s, Squire Vickers, the pre-eminent subway art director from the mid-teens to 1940, was looking for mosaic designs for the BMT Broadway subway, he chose that print, reproduced in nearby Capsouto Park. The Arch, or Stone Bridge was probably erected during the Revolution to facilitate access to the fortifications near the Collect Pond. By 1782 Broadway (or Great George street, as it was then called) had been formally extended across and beyond the ditch, clearly indicating the existence of a bridge at this time. The large double house on the SW corner of Broadway and Canal Street is the “Stone Bridge Tavern” often referred to in writings of he period. The canal ditch ran from the Collect to the North [Hudson] river at Canal Street and to the east river at Catherine Street. In early times it supposed to have been navigable in canoes. It was formalized and a sewer constructed through the street in 1819. 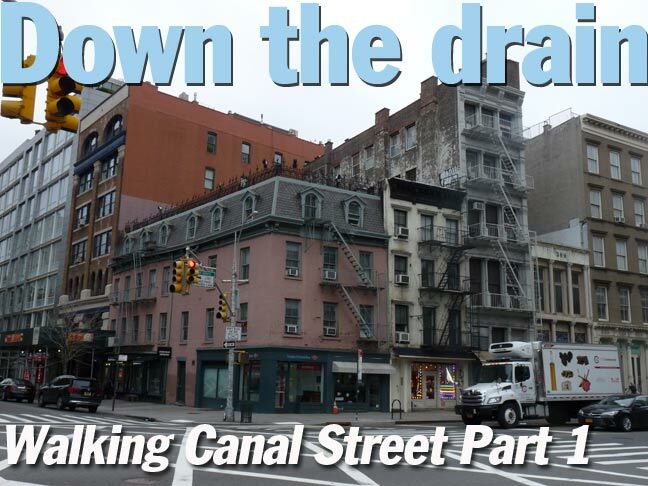 Canal Street sits atop a ditch, or canal, that drained Collect Pond into the Hudson River. The pond, located where today’s Foley Square courthouse neighborhood is today, had become fetid by the Revolutionary War and gave rise to the undesirable Five Points neighborhood. The ditch has been covered since 1819 and the road built over it is Canal Street, so named because “Drainage Ditch Street” is not exactly good public relations. Today, I walked Canal Street between Varick and East Broadway. 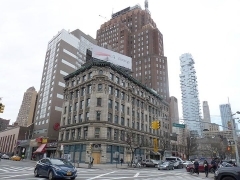 Fear not, though, I covered Canal Street between West and Varick here: the historic houses at Canal and Greenwich; the former iron arch carrying the West Side Highway over Canal Street; and the triangle park at the former Hoboken Street, now absorbed into Canal Street. 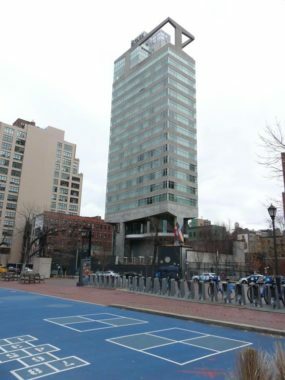 Above, the view is toward 475 Greenwich Street, known colloquially as the Zinc Building, in the wedge formed by Canal, Greenwich and Watts. The tunnel exit area at Hudson and Canal Street is known for its large, many-windowed loft buildings such as 200 and 205 Hudson Streets. 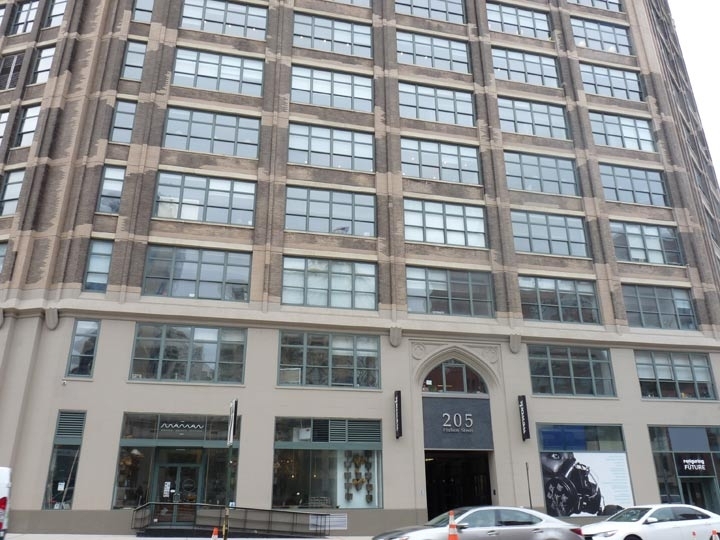 Built as warehousing lofts, these buildings are now used mainly for offices and shared working spaces as the area has become a hub known as Hudson Square. 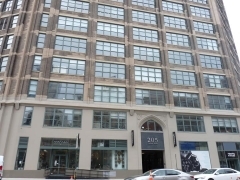 The headquarters of Havas Health, a company I recently interviewed for, is at 200 Hudson. 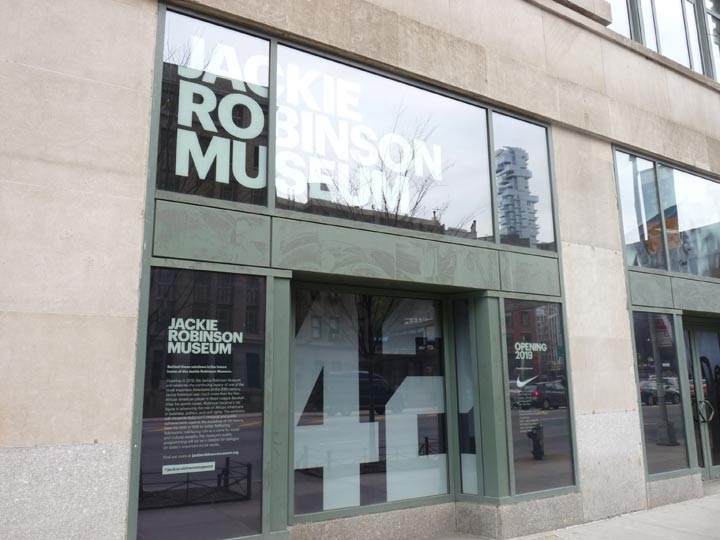 The long-promised Jackie Robinson Museum is supposed to debut in 2019 on the ground floor of the Holland Plaza Building (One Hudson Square), 431 Canal at Varick. It was built in 1930 for the printing trades (I interviewed unsuccessfully there in the early 2000s for a job with a printer). Among the current tenants are Adelphi University, New York Magazine, and Getty Images. 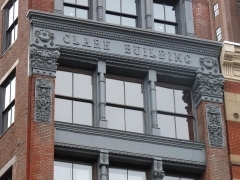 The building itself was landmarked in 2013. 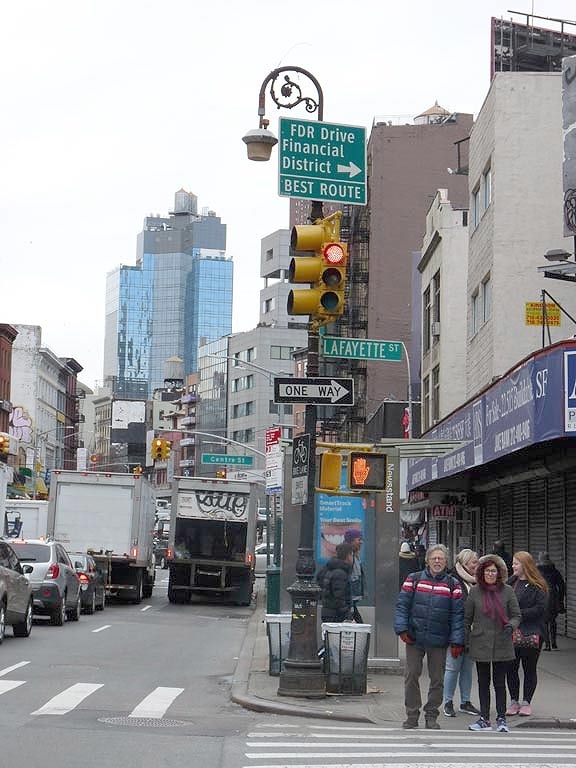 The intersection of 6th Avenue and Canal Street is one of the busiest in Manhattan and possibly NYC. 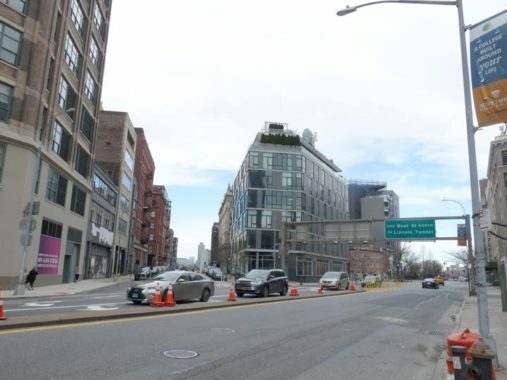 For the past several years the southwest corner has been bereft of real estate, and it’s occupied by pop up carts as well as the food flea Smorgasburg in the warm months. 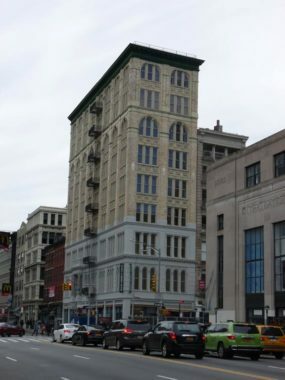 You know that sooner or later a glass tower will go up here, but till then, you have vistas of buildings like the James Hotel, shown here at 6th and Grand Street. 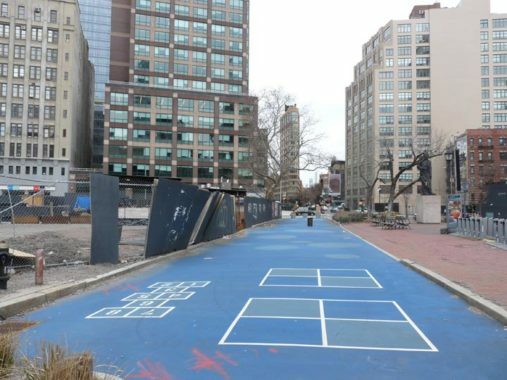 The south end of the original Sullivan Street has now been given over to hopscotch. Sullivan now begins at 6th and Watts. At the northeast corner of Canal and West Broadway are two of the oldest buildings on Canal, the corner building, #375 Canal and the adjoining #373 (Canal house numbers decrease going east). Both were constructed in 1824 by John Murray. 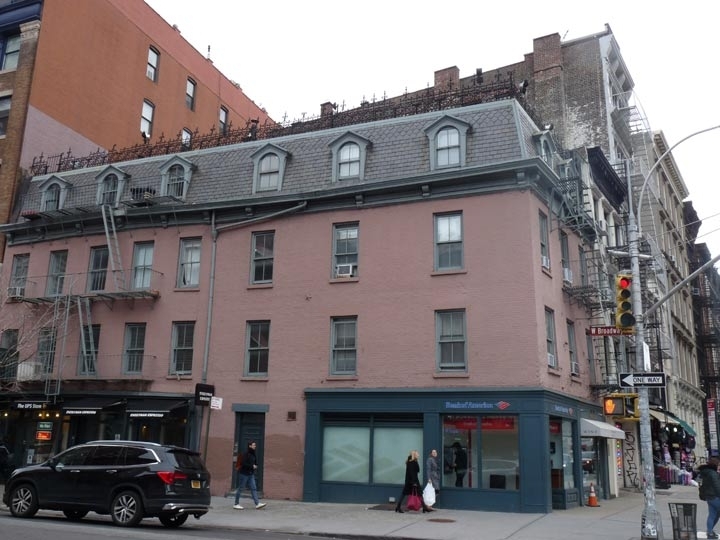 #375 received its French Second Empire-style mansard roof and ironwork in the 1860s, and #373 was renovated in 1877. 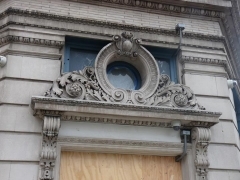 Overlooked amid the new construction is the 1897 Beaux Arts Rawitser Building at the southeast corner of Canal and West Broadway, designed by architects Brunner & Tryon. 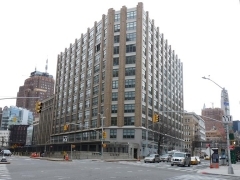 Early tenants included window shade manufacturers, penmakers, diamond cutters and International Arithmachine, which produced a very early hand calculator. In the 1940s the building was home to the Roberts Art Gallery, whose owner exhibited the first bust ever made of Abraham Lincoln. 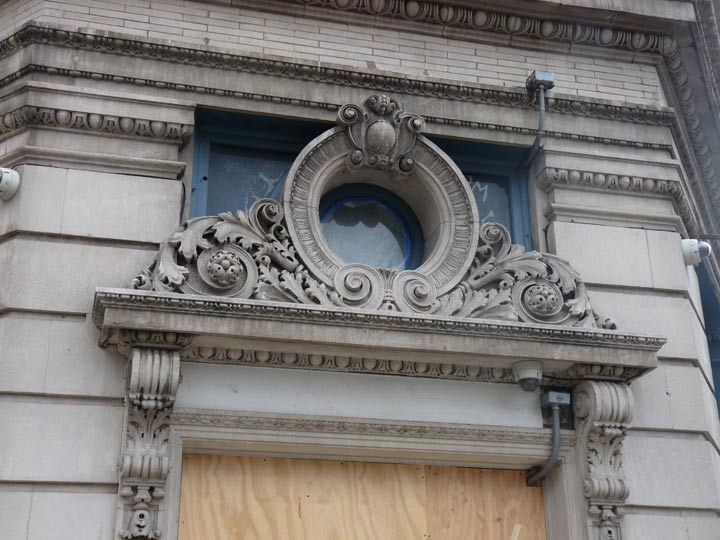 The building sits outside local landmarked districts, and so is in jeopardy from the predation of developers. #367-373 Canal, right to left. The large stone building, #367, was designed by architect William Waring and opened in 1873. 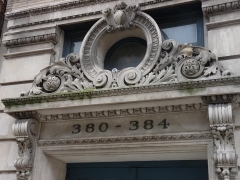 With the neighboring 369 it’s notable for its Corinthian columns. 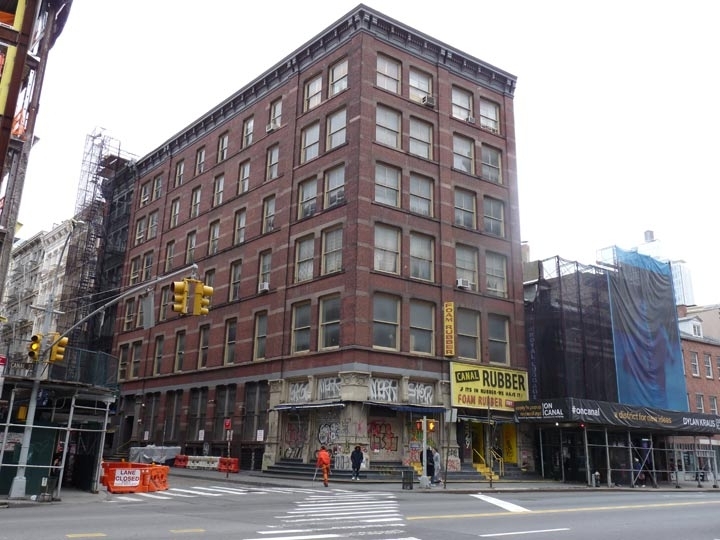 There’s a bit of mystery about #369, since the Landmarks Preservation SoHo Cast Iron District report lists 369 as a vacant lot! Unless it’s a fantastic facsimile this is clearly an older building. 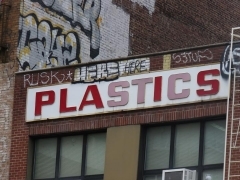 In The Graduate, Dustin Hoffman’s Ben Braddock was advised to get into plastics after his college graduation, but maybe that isn’t such a hot idea these days as Canal Plastics, #345 Canal, is the only surviving business on the north side of the street between Wooster and Greene. It’s been there since the Swinging Sixties, and I liked the sign in Futura Bold. Next door is #343 Canal, built in 1868 by architect Isaac Duckworth. 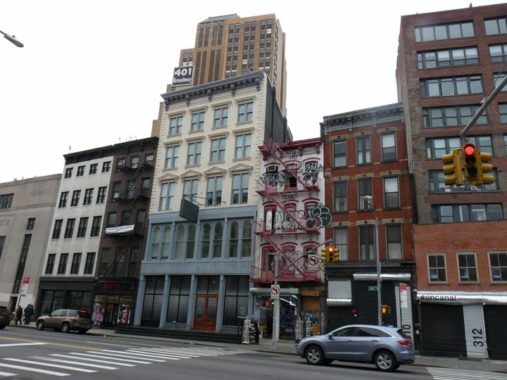 This is the south end of the SoHo Cast Iron district, and this is one of the few such on Canal. 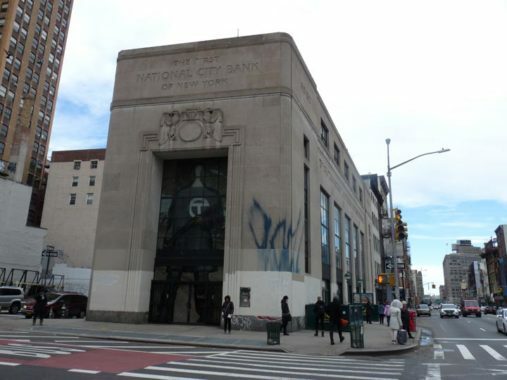 Here’s a Moderne classic at #350 Canal Street at Church Street, the Canal Street Station B Post Office. 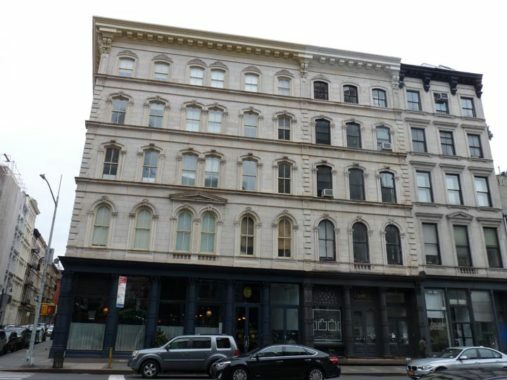 The NE corner building at Canal and Greene Street, #329-331 Canal, is officially the J.B. Snook Building, named for its architect who designed it in 1883. 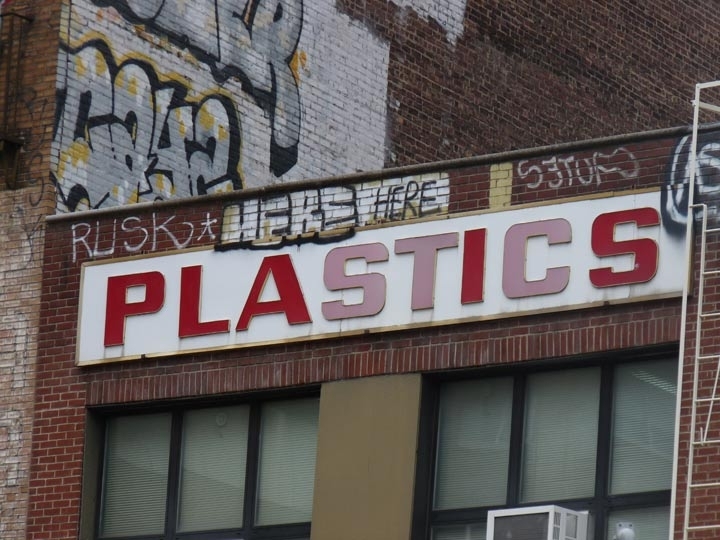 329 is home to Canal Rubber and its famous sign, “If it’s in rubber — we have it!” Unfortunately in 2019 it was partially obscured by a construction awning. The rubber emporium has been on Canal Street since 1954. The pair of buildings next to Canal Rubber, #325 and #327, were built in 1817, when the canal of Canal Street was still out in the open. 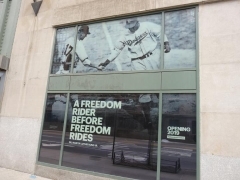 They were purchased in 2016 and were hidden under construction netting in 2019; I shudder to think what will come out of the cocoon. 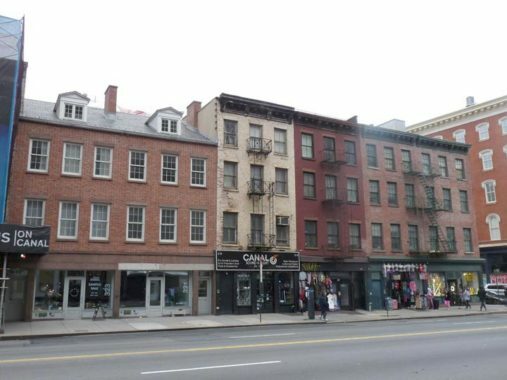 On the left we see the Federal style #321 and 323 Canal, between Greene and Mercer, which may closely resemble what they looked like when built in 1821. 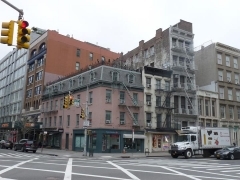 The buildings on the right date from the same period but have had third floors and cornices added. The spoilsports at Landmarks did not include the south side of Canal in a protected district, but the buildings are of equal if not better quality. #332, the blue building in the center, is 1883’s Clark Building, built for restaurateur John Clark. It’s the only building in this stretch with its name on the facade. Daytonian in Manhattan has the full story. 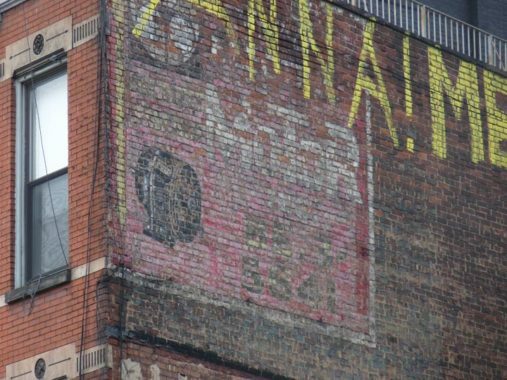 #310 Canal, where it meets Mercer, has avery old painted ad on it that’s mostly faded to illegibility. I see one word, “motor,” and a picture of a very old motor. 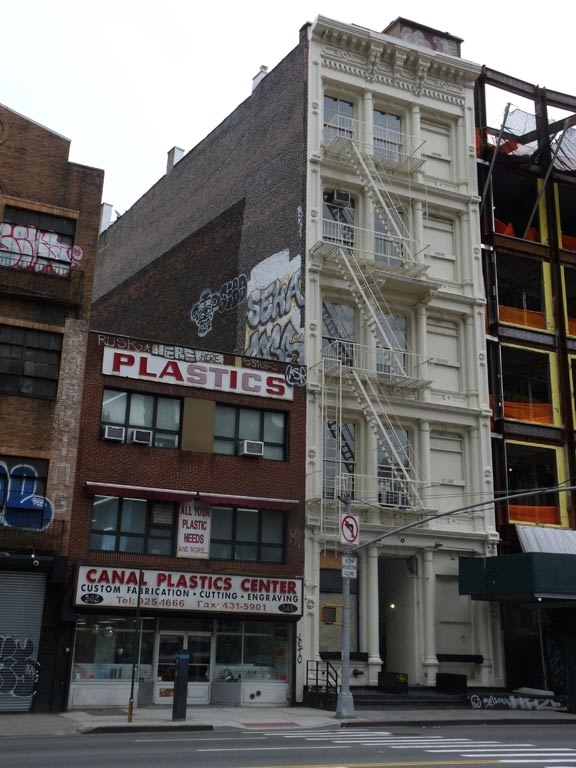 The tall building in the middle, #308 Canal, was a mecca for art supplies for generations (since 1933) when it was Pearl Paint. After Pearl closed in 2014, it became luxury condos, but a Pearl Paint neon sign can be found in the lobby. The Moderne classic has sat empty for quite awhile now. 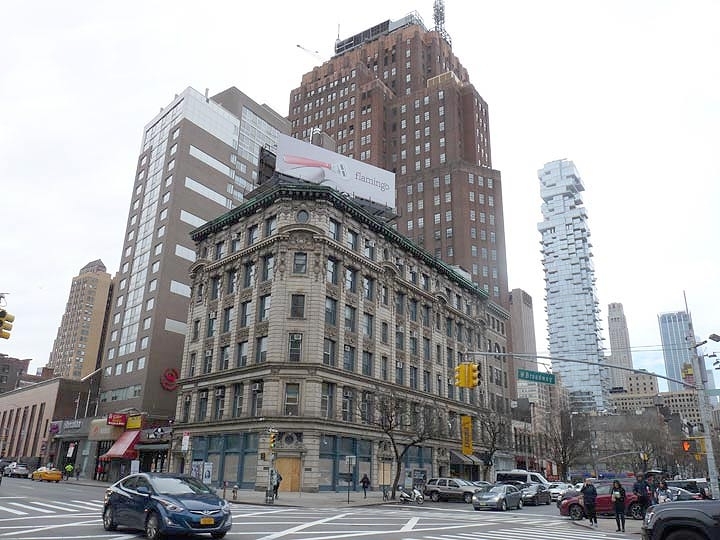 The 8-story SoHo Garden Hotel at #276-280 Canal Street at Broadway was built as 5-story Queen Anne tower by architect Lansing C. Holden in 1887 for carpet dealer Jeremiah W. Dimick, with the extra floors added in 1908. 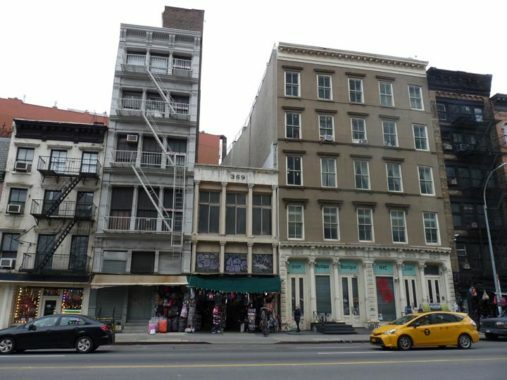 #307-311 Canal Street at Mercer was constructed from 1856-1862 and was once the Arnold Constable department store. It was founded in 1825 by Aaron Arnold, who partnered with James Mansell Constable and moved here in 1857. 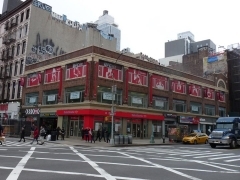 The store became known for high quality good at fair prices and by 1869 outgrew this location and moved to Broadway and East 19th Street in a building that still stands. In ensuing decades Arnold Constable expanded to the suburbs, but lost business to malls and the flagship finally closed in 1975. 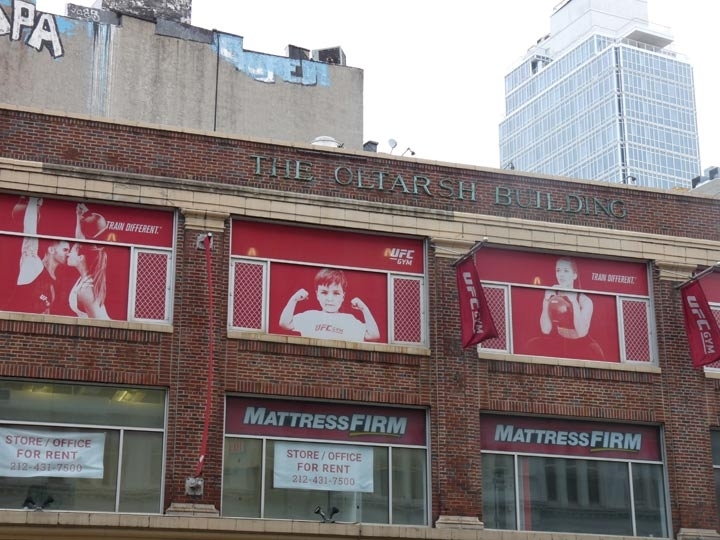 The two-story brick building at the NE corner of Broadway and Canal Street was constructed in 1927 by architect David Oltarsh, who helpfully spelled out “Oltarsh Building” in bronze letters on each side of the building. 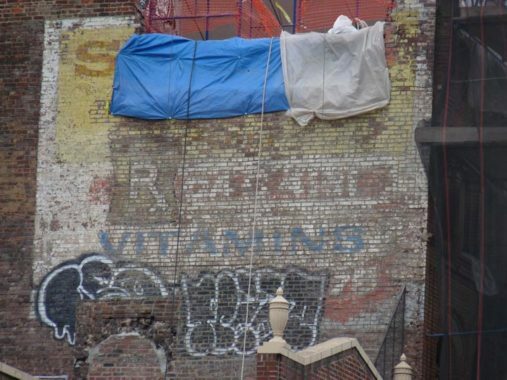 This very faded ad for a long-gone Canal Street drugstore touts “Super 8” and “vitamins” on the wall of the building adjacent to the Oltarsh Building. 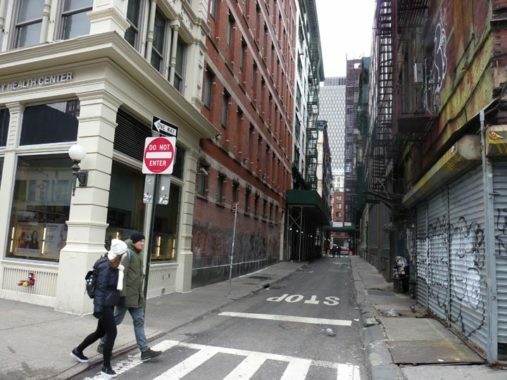 Cortlandt Alley goes all the way back to 1817, when local landowners John Jay, Peter Jay Munro, and Gurdon S. Mumford laid out the narrow lane through properties between Broadway and what would be Elm Street (which is now a part of Lafayette) and White and Canal Streets. If this 1830 map accurately reflects the reality back then, the alley might well have run along the stream leading into Collect Pond, which was soon to be placed in a canal today’s Canal Street runs over. 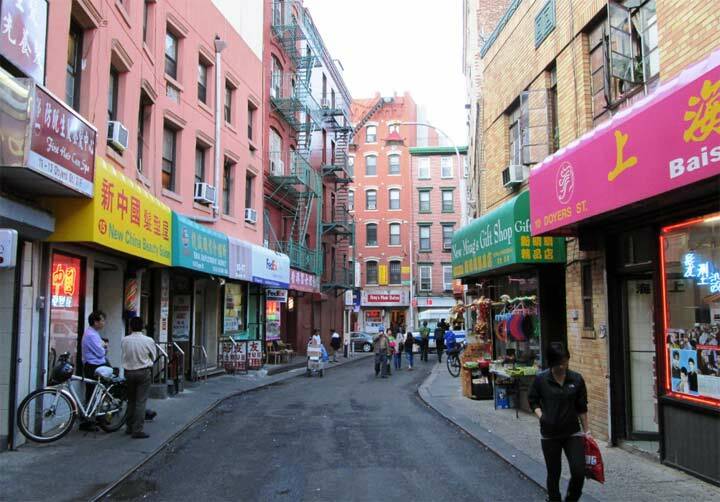 In any case, the original Cortlandt Alley presented a rural aspect much different from the one seen today. The section between Franklin and White was laid out in the 1820s and lies 25 feet farther west than the original section. It was named for a Dutch nabob, Jacobus Van Cortlandt, one of the original European landowners in these parts; the alley, Cortlandt Street, Jacobus Place in Marble Hill, and all the Van Cortlandts this and that in the Bronx, including the mansion and the park, all spring from that family. There’s an original Bishop Crook lamppost from the 1915 era on the southeast corner of Canal and Lafayette, a Type 1 BC, one of the first types produced. 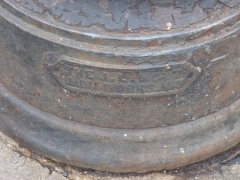 It is marked with plaques from the J.L. 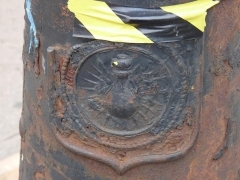 Mott Iron Works, formerly in the Mott Haven Bronx neighborhood, and the light bulb symbolic of the Edison company, which produced the original batch of castiron lampposts. The post has so many signs and electric stoplights affixed to it that I hope it’s weighted sufficiently. It has survived nearly 9 decades of Canal Street truck traffic! The Holophane sodium bucket lamp is just the latest of the many light fixtures it has supported. East of about Cortlandt Alley, Canal Street exits whatever Landmarked districts it was in, so properties along Canal Street are fair game for redevelopment. It’s a good bet that won’t happen to the handsome castiron-fronted 254-260 Canal on the southwest corner of Lafayette, known as the Bruce Building for its developer, George Bruce (1781-1866) a printing executive and inventor; he introduced stereotype, the process of printing multiple documents from a single plate. 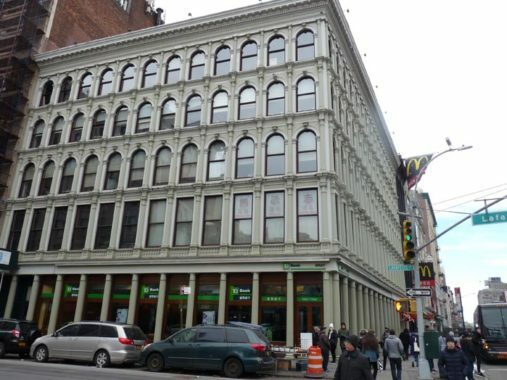 254-260 Canal Street is an early example of castiron styling and the father of the process, James Bogardus, may have had a hand in its development in 1856. In 1982, Danish filmmaker Jørgen Leth filmed Pop artist, publisher and filmmaker Andy Warhol unwrapping and eating a Burger King Whopper as part of a documentary called 66 Scenes from America. 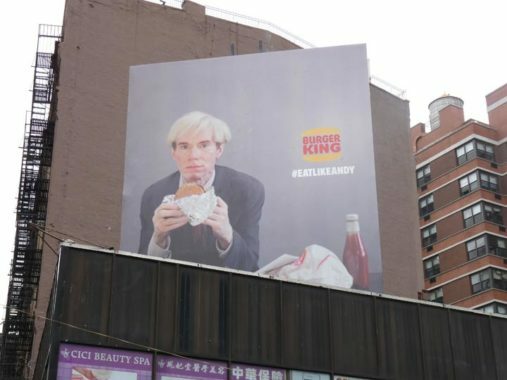 No doubt with the permission of Leth and Warhol’s estate, Burger King used the footage for a TV commercial that debuted during Super Bowl LIII in January 2019, in which the New England Patriots picked up an expected victory. A billboard high above Canal and Centre Streets punctuated the advertising campaign during the winter of 2019. 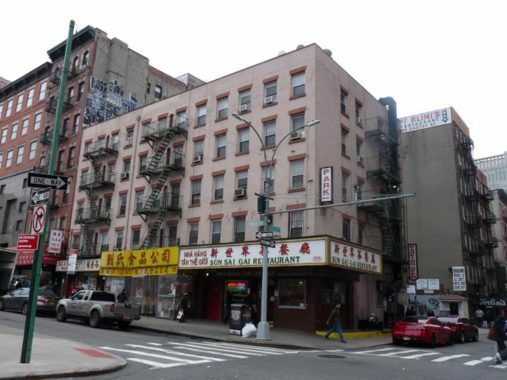 East of Lafayette Street, Canal Street becomes the main east-west Chinatown boulevard. 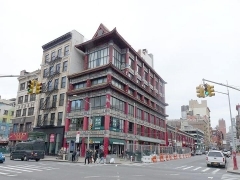 It’s amazing that #241 Canal on the northwest corner of Centre hasn’t been landmarked, but perhaps it’s still too new: it was built in 1983, designed by P.K.Y. 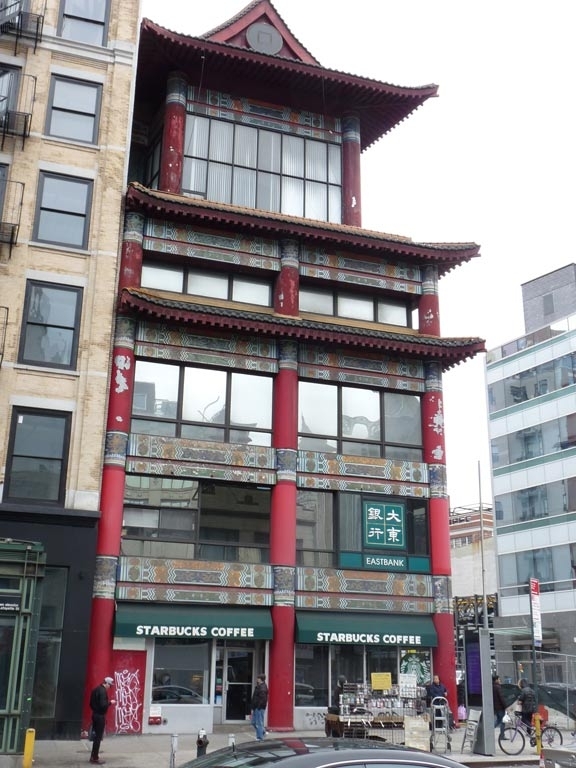 Chen as the former headquarters of the Golden Pacific National Bank, and is one of a number of Canal Street that have pagoda-like characteristics. The bank went insolvent years ago, but the building remains, occupied by a number of businesses including a ground-floor coffee joint. 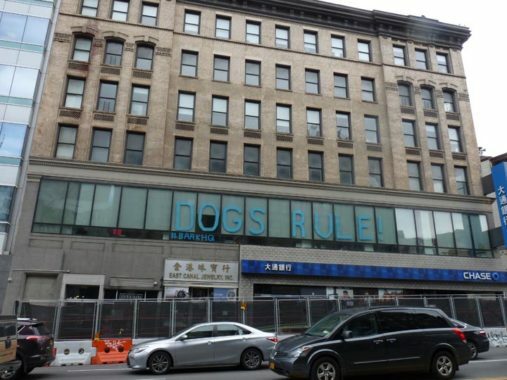 221 Canal Street, between Centre and Baxter Streets, is headquarters of BARK, a luxe day care center for pooches that doubles as a shared workspace. Canal Street runs at an angle to the prevailing street grid going east, until it meets the intersection of Baxter and Walker Streets, where it straightens, assuming Walker Street’s path. 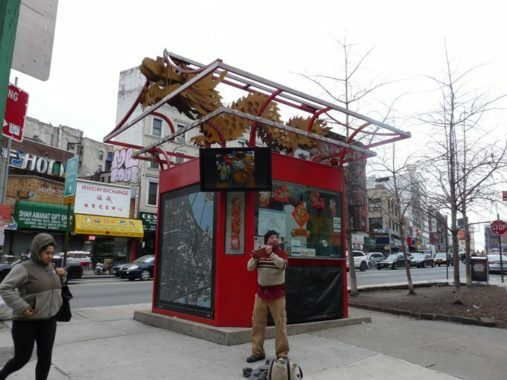 A pagoda-shaped information center occupies the triangle formed by Canal, Baxter and Walker, as did a flute player. Are the Chinese characters on the street sign a translation, or a transliteration? From what I’ve heard, shared workspaces (presumably including the ones you noticed along Canal) are becoming today’s version of the singles bar. Typically one will have a decent number of young men and women, mostly single, spending goodly amounts of time in close proximity. Unlike conventional workplaces there are no concerns about violating “mutual attraction” rules and in the event of a breakup one or both of the parties can go elsewhere in order to avoid awkward moments. I’d say it’s a very reasonable guess that most follow the typical 80/20 rule, in which 20% of the men, the Alphas, score with 80% of the women. Next to the hopscotch area is a square with 4 smaller squares. Looks like they are box ball courts. Haven’t thought of that game in years. 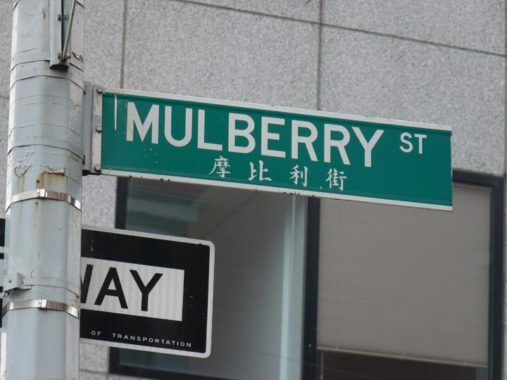 The first three Chinese characters–reading from left to right–are Cantonese pronounciation of “Mul-ber-ry,” the fourth character at far right is a translation of the word “Street.” Why Cantonese? It is because the first groups of immigrants from China [during the 1830s, according to Wikipedia] were from south China, namely villages in Canton province [Guangdong]. The decision to use Cantonese translation was/still is a form of respect paid to the early wave of immigrants.